Those of us who have the good fortune to call the Raystown Lake Region home understand that we live in an area that draws a lot of visitors. In fact, Huntingdon County averages more than 1.6 million visitor-days per year. For the record, our definition of a visitor is someone who travels beyond their normal travel zone to reach his/her destination. A visitor-day is one person in the area for 24 hours, or 4 people in the area for 6 hours, etc. From that, we can say with a fair amount of certainty that we entertain more than 2 million visitors per year in Huntingdon County. Those 1.6 million visitor days brought with them to Huntingdon County $144.1 million in 2010 in visitor spending at local businesses, an increase of 11.6% from 2009. Visitors spend money on the obvious things: lodging ($10.1 million), food and beverage ($32.8 million), retail ($25.1 million), recreation and entertainment ($27.3 million), and transportation ($48.8 million). Our tourism industry is made up of businesses and employees that have direct contact with those visitors, for instance hotels, restaurants, convenience stores, retailers, campgrounds, museums, etc. However, we only count an estimated portion of these businesses’ employees based on what wages/salaries could be supported by visitor spending. In other words, if John Doe’s Diner employs ten people, and 80 percent of the Diner’s revenue is from local residents, then only two employees (20%) would be estimated to be part of the tourism industry. Additionally, if a campground only has employees four months of the year, it would take three employees during those four months to equate to one employee for the statistic. 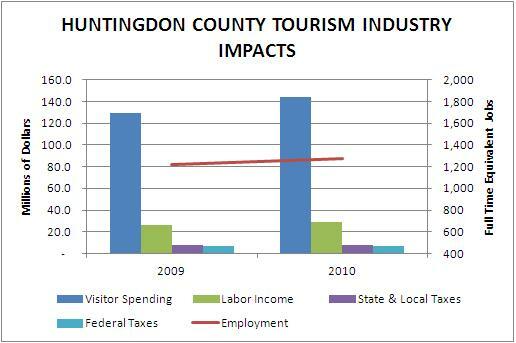 In 2010, Huntingdon County’s tourism industry consisted of an estimated 1,273 employees, a growth of 1.6% over 2009. Employment wages and salaries is not the only financial impact of visitor spending on a destination. As visitors spend money in an area, they are also paying state sales taxes on goods and services, local amusement taxes on entertainment, hotel occupancy taxes on their indoor accommodations, not to mention a whole host of taxes on the gasoline or diesel fuel they use to power their car, truck, van , RV, and boat. On top of the taxes on visitor spending, the businesses serving those visitors pay taxes on their properties, corporate net income, and a share of wage taxes for their employees. The employees also pay taxes on their income, local services taxes, etc. All told in 2010, the tourism industry in Huntingdon County yielded $7.6 million in tax revenue for our state, county and municipal governments, and another $6.8 million in federal taxes. What this all means is that because Huntingdon County draws visitors and their money to the area, the average household saves $450.34 per year in state and local taxes.